The search for bronzers for Women of Colour can be a REAL LIFE STRUGGLE. Bronzers were practically non existent to us (must be that WoC are so dark they must not need it…KMT) a few years ago. Thankfully with time and more awareness, a few brands (very few) have really stepped up and are starting to realise that even WoC need bronzer from time to time. I’ve been on a search for bronzers suitable for WoC like myself for a long time, I’ve purchased more than a few duds (NYX, Seventeen, B. is for Beautiful) which are now collecting dust but I’ve also come across a few gems which I’m going to share with you today. Please note, this is not a post telling you that you must get these, this is just a post on my bronzer collection that suit my skin tone (NC50,) if you are 3/4 shades darker than me, some of these products may not suit. I believe the bronzing effect can be recreated by using other products such as eye shadow – blending a deep brown with a brownish-red shade can give off a similar effect too! I have 4 bronzers in my collection that I reach for on a regular basis. 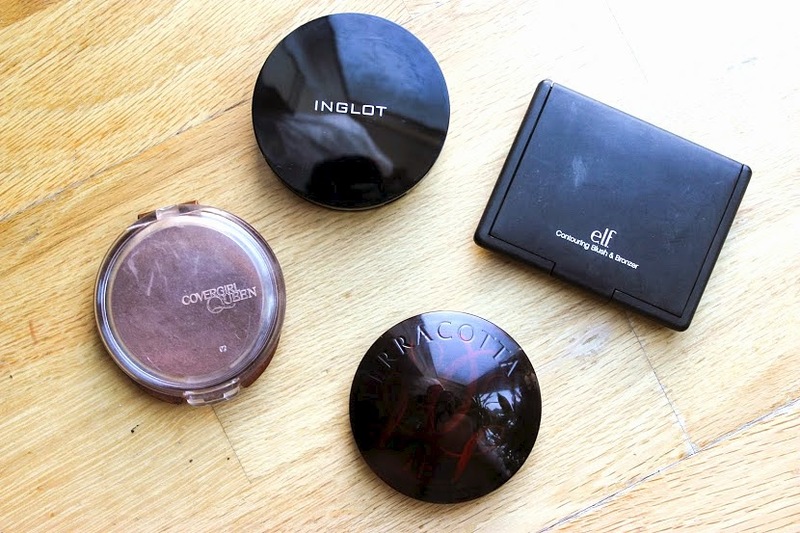 Funnily enough this is not actually a bronzer, the Inglot AMC Powder is a sheer face powder with immense colour pay off. I initially came across #68 whilst perusing the Inglot store for another face powder, I saw the shade and immediately knew this was a perfect bronzing shade for my skin tone. The powder itself is amazingly buttery and soft and ever so easy to apply.The colour is fantastic, a deep matte brown with a slightly reddish undertone. This is a great everyday bronzer due to it’s matte finish, however you have to be careful not to go overboard as this is so pigmented! I’ll be reviewing the AMC powders in more depth soon so keep an eye out! Two products for the price of one from ELF, however today we’ll just be focusing on the bronzer in this duo. I have to admit I wasn’t expecting anything great from this duo but I decided to give it try since ELF were having 50% off at the time (check out my ELF Haul post for more info) the worst that could happen would be that it would end up collecting dust like my other duds. 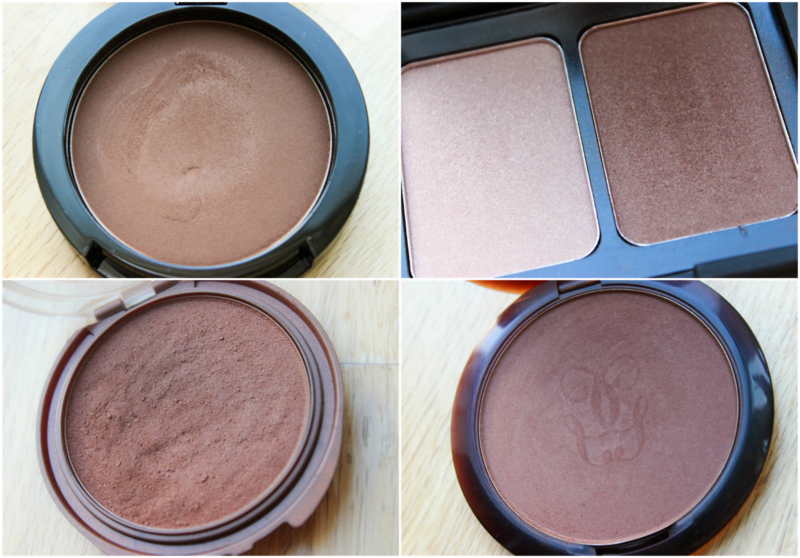 However, my mind was blown when I used it, the bronzer was more than I expected it to be and more! Soft, buttery and beautifully shimmered, this bronzer is a HIT! The burnt sugary brown shade works so well on my skin tone, providing a really natural and blend-able bronzed look to my skin. The bronzer itself does not lack pigmentation, if anything it packs the pigment, this combined with it’s soft and pliable texture make it a winner for me at only £3.95! You can see me wearing Turks and Caicos HERE, you’ll be able to see how I used it to warm up a foundation that was a tad bit too light for me. I first purchased this bronzer 2 years ago and at the time it had cost me $19 (£12.64 for two inclusive of shipping) so I’m pretty annoyed to see that it has gone up but that’s only natural with demand. The CG bronzer was the first bronzer I had every purchased that worked with my skin tone and the bronzer responsible for initiating my love of all things bronzer! I love the warm deep brown red shade with subtle shimmer that Ebony Bronze gives me, it makes me look healthier and really warms up my face which is something NC50’s need due to our yellow undertones. Now, although I do still love this bronzer, it can be difficult to work with, this could be down to how long I have had it but I find it solidifies very easily. I have to scratch off the top layer to really get it to work with me. It is not buttery like the previous bronzers I have mentioned but I do still like it as it is more red based than the above, giving it a distinct difference compared with my other bronzers. Probably not unfortunately but this is mostly due to the price increase. The most expensive bronzer of the bunch but it had to be bought! There is something about this bronzer that my other bronzers do not have, it’s hard to put my finger on it, but I think it’s because it’s not so obvious. This bronzer is great for those of you who want the most natural bronzed look. Ebony (the darkest shade) is a deep brown shade with a slightly red undertone (noticing a pattern here?) and the subtlest of shimmer. The small amount of shimmer really does add to the skin giving off a gorgeous healthy glow that almost appears dewy. The texture itself is soft and the bronzer is very easy to apply and blend. Out of all my bronzers this is definitely the one I prefer to apply with a big fluffy face brush (RT Powder Brush) for a super flawless finish. You can see my review of Guerlain’s bronzer HERE. This post wouldn’t be helpful without swatches too! I’m hoping in the near future I can add more bronzers that are WoC friendly to my collection. Do you know of any WoC friendly bronzers? What bronzers do you use? I love Inglot as a whole! Such an amazing brand! And yes! ELF have some offers from time to time would definitely recommend picking up that bronzer when you can! The Guerlain bronzing powder will be mine, i've had sleepless night's over it. Oh and I am impressed with the swatch for the ELF one, I may have to buy it too. I did too!! It is so beautiful! A lil bit pricey but worth it! And def get the ELF one, works fab as an everyday/handbag bronzer! My CoverGirl bronzer was like trying to rub gravel on my face! So hard! But I crumbled it down to a powder and it works better 🙂 a lil messy though lol. The only con of the CG bronzer. I need to do the same you know, I think this is one of the reasons why I don't reach for it as often anymore!